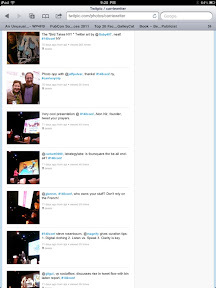 My Twitter stream from Jeff Pulver's #140Conf in New York in June. Those who love social media and attending live events know that combining the two is not only fun, but is a great way to improve your reporting skills, practice with new equipment, meet new friends both online and off, and chronicle your experience. Of course, if you're live blogging many of the sessions you're attending, or posting all your photos to Facebook and Flickr, you're well on your way to having a good online journal of your experiences. But if you're super busy at the event and only have time to hop on board the hashtag and tweet some soundbites, Twitter can still be a great way to organize your resources and communications once you're back home, as well as maximize your connections. The event Twitter stream can be a rich resource of information for anything from online resources, to connecting with influences and leaders in your industry. Be sure and Follow individuals and organizations of interest if you haven't already, and review their stream so you can learn more about their friends and followers, review their websites and blogs, etc. Retweet a post of theirs that you like, maybe even with your own take on it, and there's a good chance they'll follow you back. Review your stream as a reminder of event highlights and key moments. Were there resources mentioned that you need to get hold of for your library or research? Was there a q&a session that would make a great blog post or webinar? What about retweets? Make sure and follow those who took note of your content during the event. You may eventually serve as guest bloggers for each other's websites, or guest speakers at each other's events. If they've created Twitter lists, don't forget to review those as well, and start following them. You can also create your own Twitter list from everyone you met at the conference and can more easily view their updates in future. Every workshop or keynote is a possible blog topic, video, book chapter, or white paper. Review your tweets for content areas that particularly interest you, and add them to your blogging notes or schedule. At the #140 Conference in New York, I took some video, but since the event was live streaming, I changed strategies and decided to photograph the videos in the presentations that really stood out, so I could return to them later on YouTube, and connect there as well. I also did this at the 2009 Affiliate Marketing Summit in New York. During Peter Shankman's terrific keynote, he aired one of my all-time favorite videos, "Where the Hell is Matt?" I took a photo as a reminder, and I must have linked to it a dozen times since then! Tweeting at an event isn't only about capturing soundbites, but emotional highs and lows, and humor, as well. If you were tweeting on your toes, you captured the range of the story being told, and you can use this to dramatize your content for your readers. In other words, you're being a good content curator, and providing the best essence if what was conveyed. At the New York Conference, for example, I was particularly inspired from a marketing point of view, by Gaby, a struggling artist whose one tweet to Kodak got him a marketing deal. Not bad. Other moving tales ranged from health care stories where patients tweeting for cures got the attention of internationally known oncologists, and social media for good was used in underdeveloped countries to establish water filtration systems and economic incentives. What about you? How have you used Twitter as a resource when returning from a conference or event?